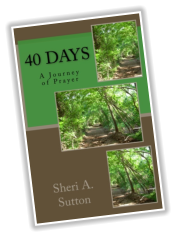 In 40 Days, Sheri A.Sutton gives us principles found from four different prayers that can impact the our everyday life. Why is prayer such an important aspect of our lives? Prayer is an extraordinary connective force and connects us to a higher power, to nature, and to each other. Throughout the ages, many have survived varying difficult and unthinkable circumstances because of prayer. Prayer gives us courage when we are fearful, hope when we are hopeless, and strength when we are weak. It is the part of life’s journey that allows us to find answers to puzzling questions and solutions to difficult situations. Prayer empowers us to do the unexpected and raises our consciousness to be more in tune with ourselves and the world around us. 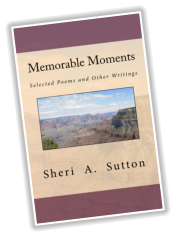 Memorable Moments offers readers selected poems and other writings that focus on the moments in our lives that give meaning to the ordinary and transform us. Poetry gives us a way to express what we often cannot express in conversation. Although poetry is developed through our own experiences, or perhaps our perceived experiences, it exposes an intimacy that we cannot bear otherwise. Of course, poetry is subjective. We do not all like the same. Sometimes the poet has one destination in mind, and the reader arrives at another. Often times, the content of the poem does not resonate with the reader. However, poetry often speaks to us when nothing else does. It connects us to mankind and asks us to recognize and accept the human condition in all of us. 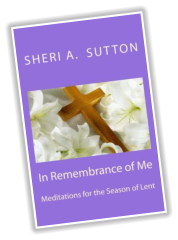 In Remembrance of Me is a book of meditations for the season of Lent. Each day includes a Scripture reading, a reflection on the main idea, and ends with a prayer. 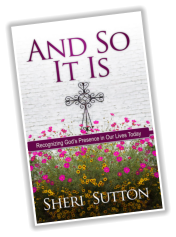 Sheri A. Sutton's thoughtful use of Scripture and down-to-earth approach uses everyday experiences to bring the reader into a conversation about the life, death, and resurrection of Jesus Christ. Sutton writes "When we open our minds and hearts to the presence of God, the spirit of the Son is made known within us. When we allow him to transform us, we become testaments to God’s resurrecting power as revealed in our daily lives. And when we proclaim our faith in the risen Christ, we become followers of someone remarkable—a Savior for all mankind." The Advent season signals our expectation and preparation for the birth of the Christ-child. It is this time period in the Christian religion that offers us the opportunity to share in the ancient longing for the coming of the Messiah and to anticipate his second coming as well. 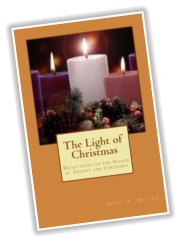 In The Light of Christmas, Sheri A. Sutton focuses on several themes dominant during the Advent season—hope, preparation, joy, and love. We hope for the fullness of God in our lives by our own intimate relationship with Jesus Christ. God is born within us through the birth of the Christ-child, and we prepare our minds and hearts for this experience just as God prepared the way to Bethlehem. When we experience the incredible gift of Christmas, we are filled with a deep, profound joy because we know with certainty that God’s unconditional love is for each of us. Where is God in today’s world? No matter where you are in your faith or your life, And So It Is gives you an opportunity to develop and strengthen your relationship with God through the relevance of Scripture, as it applies to everyday experiences.The daily devotionals presented inside capture in a few words a topic for reflection and meditation that allows you, the reader, the opportunity to discover God within your life circumstances. You will be taken through the Bible from Genesis to Revelation as each day highlights a verse for contemplation.Through the words of Sheri Sutton you will see that (1) God exists in all things, (2) God is always faithful, and (3)God's love is forever. Since God is found in the ordinary, as well as the extraordinary, And So It Is will help you find God’s presence in the everyday activities of your life.